A great part of Christmas is the abundance of yule logs, aka chocolate logs, that are suddenly available. 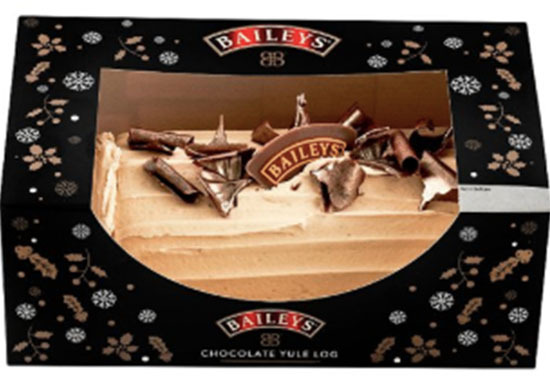 Tesco have managed to improve on the already delicious recipe by releasing a festive Baileys version of the Christmassy dessert. Baileys partners well with chocolate flavoured things – just ask whoever invented the Baileys hot chocolate. So of course it’s only natural for the creamy liqueur to be combined with the chocolate spongey goodness of a Yule Log. The delightful dessert is smothered in Baileys flavoured frosting and sprinkled with chocolate curls, making it the perfect grand finale for your Christmas dinner. I think it could be made even tastier if paired with a glass of Baileys, just for good measure. The supermarket are selling the chocolate log for £5, and though it’s technically supposed to serve eight people, I can almost guarantee their suggested portion size is too small. Chocolate sponge filled with chocolate flavour frosting, coated in milk chocolate, masked with Baileys frosting and decorated with lustered milk chocolate curls and a coloured chocolate plaque. So basically, lots of Baileys and even more chocolate. Sounds delightful. I think it’s going to be hard resisting a slice of the cake before Christmas Day! If that indulgence isn’t enough for you, then you should also make sure to stock up on tubs of Maltesers buttons while you’re down at Tesco. The tubs contain 400g of the deliciously creamy yet crunchy treats, and will certainly make the perfect chocolate for Christmas snacking. At just £4 per tub, you’d get the equivalent of 12 and a half regular sized packets of Maltesers buttons while saving yourself around £3.50 and all the faff of opening the separate packets. I don’t think you could get a better deal if you tried! Chocolate lovers are over the moon about the new product, with many sharing ideas for uses of the buttons on Twitter. Hi Everyone if you are doing your food shopping in Tesco today come down pick up a Maltesers Buttons Xmas Buckets up for £4 this is a great idea if you are watching a movie with your friends or by your self come down pick this up before it’s sold out in the store. maltesers buttons for breakfast? Oooh yes I think so. It’s a good job Christmas is a time for indulgence, because there’s certainly going to be a lot of it with all the chocolate treats available!